2. What Conditions Does Chiropractic Treat? 4. What does the adjustment or manipulation of the vertebrae actually do? 5. Can I adjust or "crack" my own neck? 6. Can I have chiropractic care after back surgery? 7. How old should a person be before he or she begins chiropractic care? 8. Is There Any Research on Chiropractic? 9. What are rehabilitation exercises? How are they different from other types of exercise? 10. Why do rehab exercises work so well? 11. When do I have to do rehab exercises? Every day, every week? 1. What is Graston Technique? 2. Where is the Graston Technique is recognized and used? 3. What is the number of Graston Technique Treatments needed? The chiropractic profession is the third largest area of health care (after dentistry). Originating from the Greek words "cheiros and pracktos" which when put together means "done by hand", chiropractic involves manual manipulation of the body in order to promote healing and optimal health. Chiropractic includes the treatment of back, neck and joint complaints, and offers rehabilitative exercises and nutritional counseling. 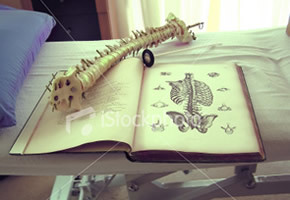 It is based on the relationship between the spine and nervous system. Various techniques are used to help relieve an assortment of disorders and are specifically tailored to the condition being treated. These techniques include spinal manipulation, flexion/distraction (a form of traction), and numerous soft-tissue techniques such as Graston Technique. Chiropractic is an integrative health care therapy, involving a blend of diagnostic strategies such as X-rays which can be taken during your visit. It is generally known that chiropractic has been effective in the treatment of low back pain, as well as neck and joint complaints. However, people are becoming increasingly aware that chiropractors treat many additional conditions, including headaches, muscle spasms, bulging or herniated discs, spinal stenosis, arthritis, pinches nerves, numbness or tingling to the arms or legs, and injuries to extremities such as shoulders, wrists, knees, and ankles. Your first visit to a chiropractor will involve a comfortable and comprehensive history and examination conducted by Dr. Kline who is thoroughly trained to diagnose and treat a variety of health complaints. A treatment plan will be custom tailored to your individual needs. I believe in a team-treatment approach. If chiropractic is not the appropriate treatment for your particular condition, I will happily refer you to the best place suited to manage your care. It separates the joint briefly, which stretches it and brings in joint fluid to promote normal motion. This can sometimes cause a "popping" sound which British research shows is caused by gas rushing in to fill the partial vacuum created when the joints are slightly separated. There is a release of carbon dioxide (C02) and nitrogen gasses, much like opening a can of soda. It stimulates receptors in the spine, which help block pain and normalize nerve signals. The adjustment increases blood flow to that area, which promotes healing. The muscles around the joint are stretched, which relieves muscle spasm and restores joint motion. Improves motion and decreases pain. Some people can "crack" their own joints until they hear a popping sound, as during an adjustment. This is because they have joints that are highly moveable (hypermobile). These hypermobile joints exist above and below a spinal segment that is "restricted" in a certain motion. This is the body's way of compensating. If you are making your joints pop, you are not actually adjusting yourself, you are only making the joints that are already moving too much, move even more. After time, the surrounding muscles will tighten, forming a muscular-type brace to protect the spine. This results in a "stiff neck", headaches, pain, and decreased range of motion which could lead to degeneration and arthritis. Yes. Please contact us so that we can discuss your surgery and develop a treatment plan. Chiropractic patients range in years from birth to old age. The spinal adjustment and treatment approaches are tailored to each individual patient. Treatments are modified based on the individual's age and medical history. Dr. Kline has had extra training in pediatrics, and is in the process of completing a specialization in the chiropractic treatment of children (infancy to adolescent) and mothers (pre and post delivery). He also experience working on a predominantly geriatric patient population at Monroe Hospital in Rochester, NY where the average age was ~85 years old. There are more than 73 randomized, controlled trials that have compared spinal manipulation to many other modalities of treatment for back pain. Multiple studies have shown that patients undergoing chiropractic care are very satisfied with their treatment. Chiropractic has been demonstrated to be a cost-effective method of treatment for patients with back and neck pain. Attitudes of physicians and older adults about chiropractic care. Rehabilitation or "rehab" exercises are designed to treat a specific problem, such as low back pain or shoulder pain. With most other types of exercise, the goals include building muscle size, muscular endurance, or maybe both. With rehab exercises the goals are directly related to returning you to pre-injury levels of health - maybe even beyond that. Rehab exercises are a great way to compliment the chiropractic care you are already receiving, and in fact may help you spend more time away from our clinic, enjoying the things you like to do! Rehab exercises work well because the exercises themselves actually "re-train" the nervous system to function in a more coordinated, balanced way. The nervous system controls your muscles through connections from your brain and spinal cord - you probably already know this. The question is: How does your nervous system know when to use certain muscles, and when to not use others? It's an easy question to answer if you are thinking about something like lifting a heavy object - you look at it, you grab it and you pick it up. Simple! But what about something like walking or your posture? Chances are you don't spend much time each day thinking about these things, yet they happen anyway. The nervous system accomplishes this because there are "sensors" all over your body, especially within muscles and joints, providing information about your movements and your body position at any time throughout the day or night. These sensors are disrupted with an injury, such as low back pain or a sprained ankle, and to fully recover many patients need rehabilitation to "re-train" the nervous system sensors so that normal coordination of muscles occurs. Without this, many patients continue to suffer from the same problems over and over. Your unique, specific exercise program will be determined after I take into account such factors as the state of your current complaint, your general fitness level, and the time you can commit to appointments. Once you begin, most rehab programs will be tailored into a home exercise program as soon as possible; this will allow you to stay committed to your program without the need to keep as many appointments in the clinic. Graston Technique is a fairly new procedure for the management of muscle and joint complaints. The technique is designed to detect and treat soft-tissue fibrosis or chronic inflammation. It was developed to aid in the treatment of patients who are experiencing pain and loss of function as a result of injury, cumulative stress disorders, as well as post-surgical procedures. Most patients report pain reduction and improved function within the first two treatments. The technique enables the doctor to effectively break down adhesions and scar tissue that forms between muscle fibers. It makes use of scientifically designed stainless steel instruments that detect and treat tissue restrictions that result in pain and dysfunction. 2. Where is the Graston Technique reconnized and used? Factors such as age, history of the condition, occupation, and lifestyle will determine the number of times that you will be treated. The average number of treatments is 6-8. Generally treatment is performed no more than twice a week unless the clinical circumstances dictate otherwise. It is a cost-effective, safe procedure with excellent outcomes and a high level of patient satisfaction. boston chiropractic, chiropractic office, chiropractic doctor, metro boston chiropractic clinic, lower back pain, lynn mass, chiropractic care, back pain relief, upper back pain, swampscott MA, chiropractor office, low back pain, chiropractor sports injury, chronic back pain, sports injury, carpal tunnel syndrome treatment, chiropractic college new york, back pain exercise, neck and back pain, sciatica exercise, cluster headache, treatment whiplash, arthritis doctor, neck and shoulder pain, chiropractor massachusetts, migraine headache, back pain treatment, sciatica treatment, spinal stenosis, american chiropractor, saugus, arthritis treatment, shoulder pain, pregnancy back pain, back chiropractor, salem MA, chiropractor information, graston technique, boston, arthritis pain relief, boston massachusetts, doctor chiropractor, northshore, headache, sciatica and pregnancy, find a chiropractor, chiropractor directory, sciatica, plantar fascitis treatment, boston chiropractic, chiropractor massachusetts, low back pain, neck pain, sciatica, migraine headaches, carpal tunnel syndrome, arthritis, back injuries, sciatica, lynn, ma, massachusetts, northshore, boston, chiro, Disc Problems chiropractic, chiropractor, graston technique, headaches, peabody, saugus, salem, nahant, north shore chiropracter, Plantar Fascitis"